Wednesday 10th May saw the inaugural WILDlings event take place at the offices of our generous sponsor for the evening, the CME Group, kicking off a new series of talks and events (the ‘WILDlings series’) directed specifically towards women in the earlier stages of their careers in the derivatives markets. This extension of WILD London’s activities is all about getting younger women involved in the group, supporting the next generation of women in financial markets, and offering content that will help them as they navigate their professional career paths. The series launched with a keynote presentation from Julie Carruthers, Head of Operational Integration & Transformation at TPIcap, entitled: “Making it happen – your career, your way”. With characteristic humour, Julie shared the highs and lows of her career to date, imparting words of wisdom along the way and instilling in us the message that everyone’s career is personal and we have to make it work for us. ‘The Trade’ – think of a job as a trade between yourself and your employer. If you are putting in more than you feel you are getting out, it may not be working for you. Personal goals – your career is personal and success is measured differently for everyone. It could be measured by a job title, financial rewards, flexibility… and not everyone’s measures are the same. Integrity – it’s important to always have integrity and be yourself. Think about the standards you expect of yourself on a professional and personal level, and stick to them. Don’t be afraid – fear can hold you back. Don’t be afraid to ask for help, to ask for something you want, or to make a change. 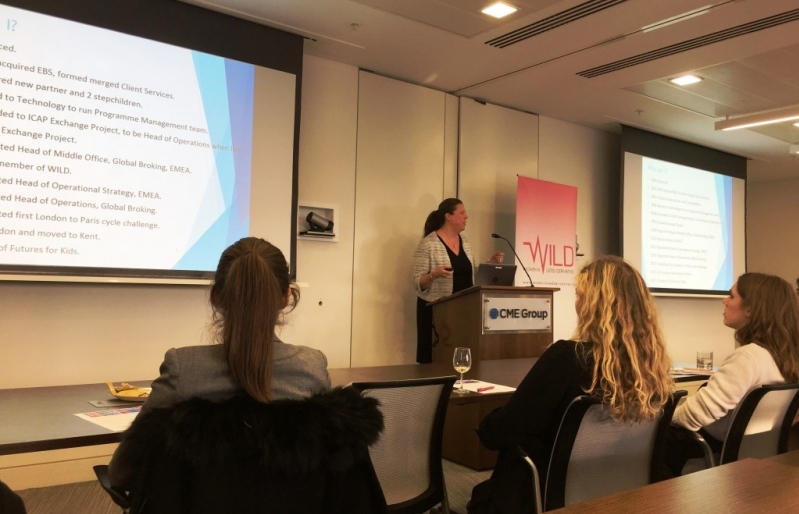 We’d like to thank Julie for her excellent presentation, and the CME Group for hosting the very first WILDlings event at their London office. We’re sure everyone who attended went away with more confidence and determination to make their careers work for them. This event was the first in the WILDlings series, which is designed to be inclusive and dynamic, and we’d like to take direction from WILD members and non-members alike as to what else we should include in future sessions. Could you benefit from a workshop about dressing for success? Steering difficult conversations? Saying no? If you have any thoughts on what you’d like to hear next, don’t hesitate to get in touch – email us at wilderivativeslondon@gmail.com. Please also let us know if you’d like to be added to the WILDlings mailing list, or to find out about WILD London membership and sponsorship opportunities.